The Innotab 2 follows on from the success of the first generation Innotab tablet but with much improved specifications. A 5 inch LCD touch screen is featured with G-sensor which detects tilts for additional gameplay. Another new addition is a rotating self-portrait camera featuring a microphone for photo and video fun. Your kids can now capture memories of themselves or their friends. To get you started the tablet comes complete with one e-book, one augmented reality game, one tilt sensor game, art studio app, calendar, calculator, friends list and notes app. 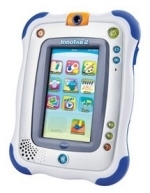 Parents can download aditional apps, games, e-books and music to their PC from the Learning Lodge Navigator and then sync the new app to the Innotab 2 via wi-fi. A cord is no longer required. Over 200 apps are available, many featuring your childs favourite characters. Your children will have so much fun with this tablet they will not even realise they are learning! It will help your childs development in many ways including their speech and language development, hand-eye coordination, sound awareness, visual development, motor skills and encourages creativity. 4 x AA batteries are required (not included). Best for ages 3 to 9 years. Size 28cm Height x 33cm Width x 6cm Depth. Three colours are available Blue, Pink and Silver (Exclusive to Argos).